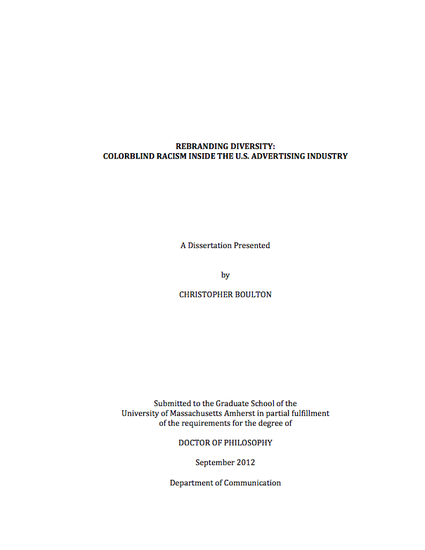 This dissertation examines race inequality inside the United States advertising industry. Based on qualitative fieldwork conducted at three large agencies in New York City during the summer of 2010 (including ethnographic observations, affinity-based focus groups, in-depth interviews, and open-ended surveys), I argue that the industry's good faith effort to diversify through internship-based affirmative action programs is overwhelmed by the more widespread material practices of closed network hiring--a system that advantages affluent Whites through referral hires, subjective notions of "chemistry" or "fit," and outright nepotism through "must-hires." Furthermore, the discriminatory nature of White affirmative action is hidden from view, masked by ideologies of color-blind meritocracy deployed by management and interns alike. I conclude that this disconnect between practice and ideology helps normalize and reproduce historic inequalities in the workplace by rebranding diversity as an aspect of individuality rather than a social problem best addressed at the group level.